The combination of these two meanings perfectly describes what it is and what it’s used for. Against all appearances buugeng is neither an ancient samurai or ninja weapon, nor a variety of the Australian boomerang. The history of this equipment is actually only 30 years long. 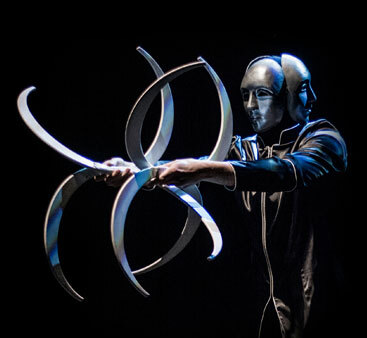 The general concept of buugeng was created by a juggler Michael Moschen in the 80’s. During his shows he started using two semi-circles joined together in a shape of a letter S. About 20 years later a Japanese Dai Zaobab became interested in the S shaped sticks, he was the first to use the name buugeng and he invented the idea of incorporating buugeng in martial arts and fireshow. Dai’s buugengs were significantly different from Michael Moschen’s semi-circles. They were parabolic in shape and reminded more of boomerangs and could be folded during the shows. plauded by both the audience and organizers. Recently he took part in the third edition of Polish “Got talent” show.